You already have zipped a folder containing a large chunk of data – could be 100MB of pictures, 60MB of presentations or 1 GB of quick video tutorial – ready for sending through Gmail? It’s quite sickening that even at this age of technological advancement, popular email clients like Gmail still refuse to accept attachments to the north of 25MB because of Gmail attachment limit. It gets worse if you don’t get to know whether your email was opened (or not) after putting such efforts in sending it. So far you can attach a file size of up to 25MB using the Gmail user interface. The size of your attachment will be determined by the size of file on disk. The 25MB cap is applied to the total of the message’s and the encoded attachment. That means any message you sent this Gmail attachment limit will result to an error and will bounce back to you. When you send files larger than 25MB, Google automatically uploads them to Google drive. And to make the file accessible to the recipient(s), Gmail places a download link to the file in the body of the text. However, if you send a file smaller than 25MB so that you bypass the need to use Google drive, your file could also end up being more than 50MB in size. Attachment encoding makes the size of the file grow slightly, and often, it doubles in size when encoded into MIME format. In a move that sounded like a much-awaited reprieve to many Gmail users, Google announced that it was going to double the Gmail mail size limit for all users. That was enough to knock off rivals – Yahoo, Outlook – and probably send them back to the drawing board. The change happened, except, that their rivals didn’t (and still don’t) really need to get worried about it. The only good news is that all Gmail users can receive emails whose attachments are as big as 50MB in size. But Gmail won’t allow you to send a 50MB attachment of your goofy holiday pictures to your friend. At least, they won’t be happy with you. Currently, no mainstream email client offers email attachments beyond 25MB. Even rival email clients such as Yahoo and Outlook limit the attachments at 25MB and 20MB respectively. Send large files with SalesHandy and track who opened it! Break it into bits and send them bit by bit. This option takes a lot of time, and could potentially annoy your recipient(s). Upload it to cloud-based file sharing services like Google Drive, Dropbox, SalesHandy, among others, and attach/share a download link on the body of the email. Drag files to the designed area and drop them. Pick all the files you want to share and insert. 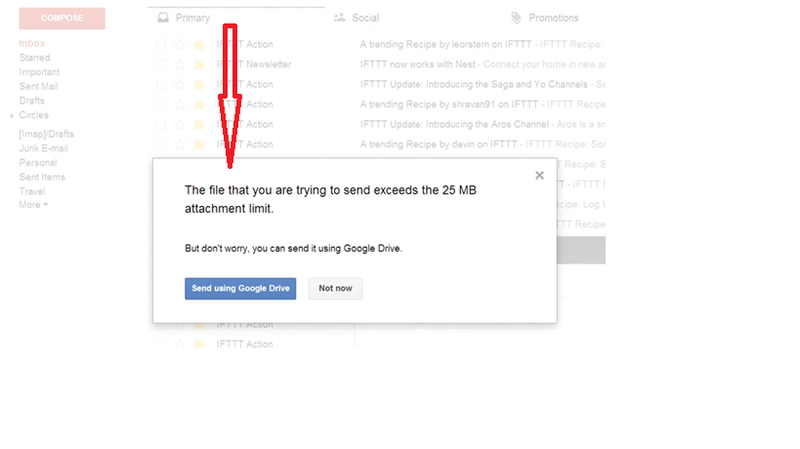 While Google Drive allows you the additional benefit of avoiding annoying people with huge attachments, it doesn’t notify you if the attachment was opened, when and how many times it was opened. With the explosion of email marketing, people are waking up to a new way of using the email clients. Nowadays, people don’t just want to send the email and wait for the reply. If you are conducting your business through email or sending critical information over email, you must be interested in knowing whether the recipient opened the attachment, or not. So, it’s no longer about firing up the email and waiting for the reply. Clicking “send’ is becoming the beginning. With more browser extensions and Gmail apps, and a boatload of tracking tools, you can easily send and track your attachment, link opening with a click of a mouse. In other words, these new tech-babies that make you feel like an email wizard (even when you are dumb at it) are quickly becoming indispensable. One of the most powerful document sharing and tracking tools, SalesHandy allows you beat the Gmail attachment limit through sharing larger files over Gmail. Shortly after your tracking-enabled email is opened, this tool will send you a notification that lets you know about the opening. You can get even more information by accessing your SalesHany dashboard where you can quickly see details of each message you tracked. 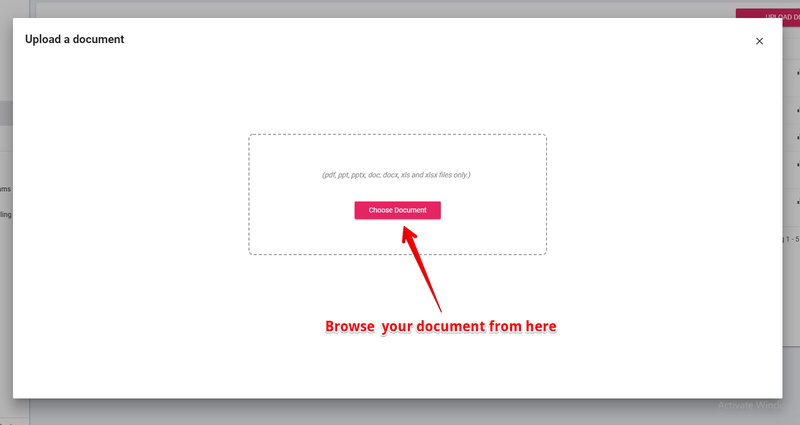 Step 1: Click on “Upload Document” as shown in the image below. Step 5: Once the documents have been successfully uploaded, create a document link and proceed to continue. Select the document you want to share it over Gmail. Step 6: Keep download option for the viewer to download the file. Step 7: Set password for security purposes – No one can see the document unless you share the password with them. Step 8: Provide the email where you want to send the attachments to. Step 9: Click to save all the settings. Click send, sit down and wait while SalesHandy does the rest of the work for you. Send large files in a pinch with SalesHandy!